Immortalized by Degas and Manet, the Longchamps racecourse is on the banks of the Seine, which is near the Bois de Boulogne. Even today it is still one of the leading thoroughbred racetracks in the world, and it opened in 1857. Manet was always a keen visitor, and his painting show the thundering horses as a single vignette, clouds of dust are raising as they run almost neck and neck and only a fragile fence are separating the racing horses form the spectators. In Manet’s painting, the race pace is so fast that the turning heads as the crowd follow the race are merging into a blur. In the 1860s a sudden increase took place in the number of painting devoted to the indulgences of Parisian life, although only a few paintings are as savoury as those the ones by Manet. He introduced offhand elegance, contemporary realism, and the historical self-consciousness that transformed art. Edouard Manet could combine cryptic allusions to art with bold and luscious paint handling, cosmopolitan sophistication and sometimes he added a new kind of directness or even awkward compositions. 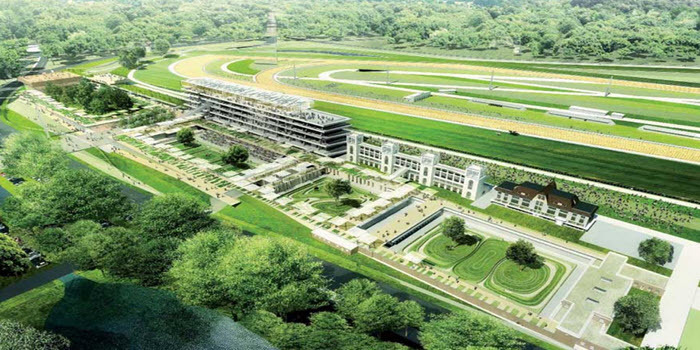 It was during the period 1852 to 1870 that horse racing enjoyed a revival, it was also then that the Longchamp horseracing track was built. Longchamp was constructed on the outskirts of Paris in a park called Bois de Boulogne. Manet started his large, horizontal work in 1863. It would convey the crowd’s bustle and the dynamism of the horse races. The panoramic composition he abandoned, although his smaller variant perfectly retains the essence in a concentrated form. The races at Longchamps in pictorial conception is simply startling. The painting shows a cluster of onrushing horses, with the jockeys racing towards the observer. The sense of explosive movement by the horses are heightened by the blurred view of the vertical staring posts on the left and the viewing-stand on the roof. Manet’s Races at Longchamps painting’s characteristics focus on modern life and the pleasures of it, the scene at the Longchamp racetrack on the outskirts of Paris shows the popularity of the track. The painting signals the revival that took place in French horse racing and reminds of when the racing took place in 1857 for the first time. Manet chooses to capture the last moments, which is also the most exciting minutes of the race, he paints the horses as the rush past the finish. Traditionally, most artist selects to show racing only from the side. It is not often that anyone dares to compose high-pace action scenes from the side. Manet composed the Racing at Longchamps in such a way that the horses and the jockey’s thunders towards the viewer. The painting medium is oil on canvas and is conserved at the Art Institute of Chicago.